Star anise is the fruit produced by a small evergreen tree grown in Japan and Star anise, as one might suspect, is star-shaped. Each of it’s eight points contains a star anise seed. Star anise has a licorice aroma and taste. 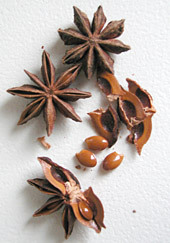 Star anise is most commonly used in Chinese cuisine. The whole star (or star pieces) is used to flavor teas, liquors and stews. Also, ground star anise one of the five spices that comprises Chinese five-spice powder. Whole star anise has a long shelf life, but once ground, it should be kept in an airtight container in a cool, dark place for no more than 3 months. If you cannot find star anise at your local grocery store, try an Asian market. This entry was posted on Saturday, November 3rd, 2007 at 6:58 am	and is filed under Encylopedia, Herbs & Spices. You can follow any responses to this entry through the RSS 2.0 feed. You can leave a response, or trackback from your own site.